To fit a Sierra LSD diff into a 'Standard' Drum braked back axle. You would be best to remove the whole axle assembly, and then remove the piece parts later at home, so that you don't forget anything. Undo the large nuts on the drive shafts whilst the axle is still in the car if you can, I believe they are 41mm socket sized, I have a 15/8" AF socket that does the trick. If you find that they just won't undo, then a trick that I use, is to grind down carefully, until you get very close to the thread, this weakens the nut, and it will undo easier. 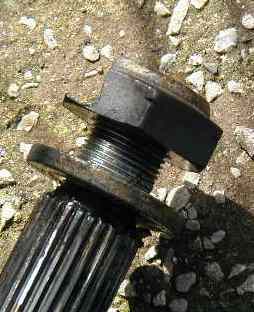 Remember that the nearside of the car has left-hand threaded nuts, you can see the 'notches' on the corners of the nut, this denotes Left-hand thread. The main problem with this conversion (apart from having to change over the brakes to disc's) is the clearance between the 'wishbone' casing, and the Lobo joint that connects to the hub unit, i.e. there is none! OK, remove your old diff unit, and replace it with the LSD one. Now clean up the large hole in the wishbone so that it takes the boss of the hub bearing casting (A quick run round with a dremil type tool is all that's needed) fit the hub bearing casting assemblies. Then uncouple your shocker to allow the wishbone to drop down more, feed in the driveshaft from behind (note the N/S shaft is shorter than the O/S one) locating the other end at the diff, jack up the wishbone, and refit your shocker. Put a couple of bolts into each end of the driveshaft & tighten them up. Fit the wheel flange, this will need persuading with a nylon hammer, fit the large nut & washer to the driveshaft and by jamming the wheel flange with a bar, nip up the large nut. Now turn the wheel flange a few times and check if the lobo joint flanges have rubbed on the wishbone casing, (mine did first time, so the shaft had to come out again for further treatment to the wishbone with the hammer & drift) Once you're happy that the joint isn't rubbing the case, you can fit all the bolts & tighten them up etc. Now you have to sort out the brakes. Then tighten up the axle nuts............Bloody tight!! !